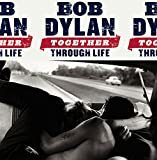 This week Bob Dylan releases his latest studio album, Together Through Life. To celebrate this release from one of America's seminal singer-songwriters, I am giving away the 3-disc deluxe edition of the album along with two of my favorite Bob Dylan books. To enter the contest, leave a comment in this post and name your favorite song (by Dylan or anyone else). The winner will be chosen randomly at midnight CT Friday evening (May 1st), and will receive this book along with several surprises.